My husband and I head to Las Vegas on every once and awhile to catch up with friends. Even though we're not big gamblers, the idea of sitting poolside with cocktails and good company is something we're always willing to travel for. On our most recent trip, a cheap flight brought us into the city a day earlier than the rest of the crew. Sure, it would have been easy enough to spend the night sitting at the slots and going out for dinner, but I figured it was the perfect opportunity to go for a little adventure off the strip. After a spending a bit of time on the internet, I was pleasantly surprised by all the options available. Within about four hours one-way you can visit national parks such as the Grand Canyon, Zion, and Death Valley. While it was tempting to check out one of these three parks, since we were arriving in the early evening, I thought the smartest option was to pick something a little bit closer, especially since the slightest airport delay could have really sidelined the entire plan. During my research, I found a lot of positive feedback about the Valley of Fire (VOF), Nevada's oldest state park. At just 63 miles from the airport with a hotel nearby, it fit just what I was looking for. 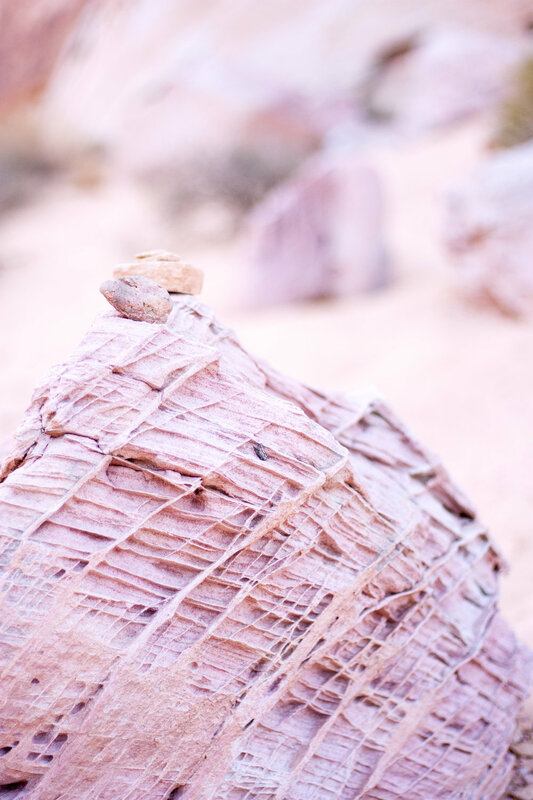 The park boasts 40,000 acres of bright red Aztec sandstone outcasts nestled in gray and tan limestone, including petrified trees and petroglyphs dating back more than 2,000 years. There are plenty of trails to hike and there is even a campsite for those who want to stay onsite. We decided to stay at the North Shore Inn, a budget friendly hotel in Overton which is less than 14 miles from VOF's East entrance. It was dark when we arrived at the hotel and had no clue what our surroundings would look like in the daylight. Being from Colorado and having experienced our local Red Rocks on a regular basis, I was a bit fearful this excursion would be too familiar and underwhelming. My answers would have to wait for the morning. Though every part of me had wanted to sleep in (it was a vacation, after all), I knew sunrise was going to be the best light. We begrudgingly pulled ourselves out of bed, hopped in our mustang, and hit the road a little sleepy-eyed. Just as we started to make our way to the entrance, the sun began to hit the horizon and the thought of sleep slipped to the back of my mind. We parked the car and found ourselves in Mars-like terrain, overwhelmed by shades of pink and red surrounding us. Time commitments meant we could only hit a few of the trails in the park, so we had to be efficient with our stops. We spent sunrise at Elephant Rock and the remainder of our time at Mouse's Tank Trail, Fire Canyon Overlook, and the trailhead of White Domes. I had a mission of going to the Fire Wave trail which wasn't published on the VOF official website at the time of our trip, but due to poor cell service I couldn't pull up the exact location on my phone and we had to forgo this spot. As of fall 2016, the park did not have signage for this trail, so be sure to do your research and know where to go so you don't end up missing this gem. Fortunately, I had more than enough to see in the short amount of time we were there, including some wildlife! As we were leaving the park, my husband and I both concluded VOF was a worthy stop, and we were so pleased to have stepped into this beautiful location. If you have some spare time to get off the strip, consider adding VOF to your next day trip! Precaution: This is a desert area, be conscious of the time of year you are traveling and adjust your hiking times/lengths accordingly. Bring plenty of water!